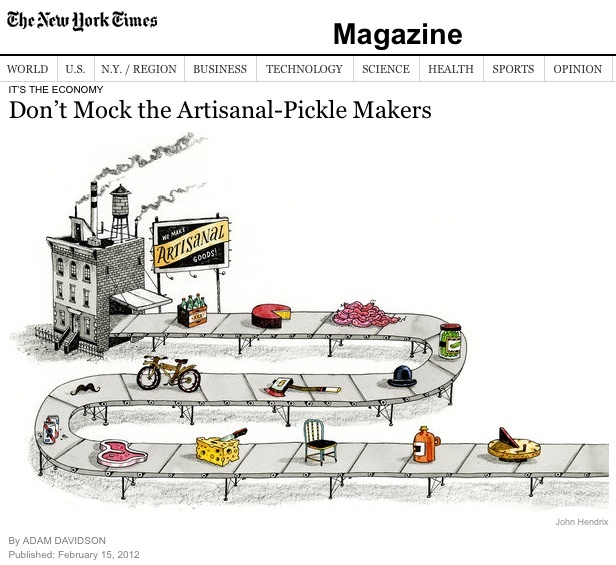 SustainableWork: Food and jobs - "Don't Mock the Artisinal Pickle Makers"
Food and jobs - "Don't Mock the Artisinal Pickle Makers"
Our Wisconsin Innovation Kitchen is helping pioneer new business models for developing sustainable artisan food businesses. We are helping to create new tools and markets for growing businesses and creating jobs through local foods and regional food systems. There was a great story in the New York Times recently, by Adam Davidson of NPR's Planet Money. This idea of small batch manufacturing has been emerging and getting better all my life. It was the core of our business model for the 25 years we ran our first startup. Now I have the honor to work with the emerging capacity of the Innovation Kitchens to make small batch artisan foods for safe, legal, commercial sale to the public. This is a great way to grow new businesses, create jobs, and rebuild the economy. The quotes below are from the New York Times (emphasis added). "It's tempting to look at craft businesses as simply a rejection of modern industrial capitalism. But the craft approach is actually something new — a happy refinement of the excesses of our industrial era..."
"As other countries move into mass production, the United States, even in the depths of economic doldrums, has a level of wealth that translates to fewer people willing to do dreary, assembly-line work at extremely low wages. More significant, we're entering an era of hyperspecialization. Huge numbers of middle-class people are now able to make a living specializing in something they enjoy, including creating niche products for other middle-class people who have enough money to indulge in buying things like high-end beef jerky." The Innovation Kitchen model can help artisan food entrepreneurs from across the US and from around the world operate legal, safe, food enterprises in North America while supporting great jobs for people in need. Get ready to expand your existing food business. Start one of your own. Join us! The new artisan economy, (an earlier blog post) quoted a great study to conclude, "The next ten years will see a re-emergence of artisans as an economic force." Graphic artist John Hendrix did the great graphic for the NYT piece shown above. John is a fabulous graphic artist with many credits and a great gallery at his site!